Ubud is now known as the centre of Bali’s arts and crafts. 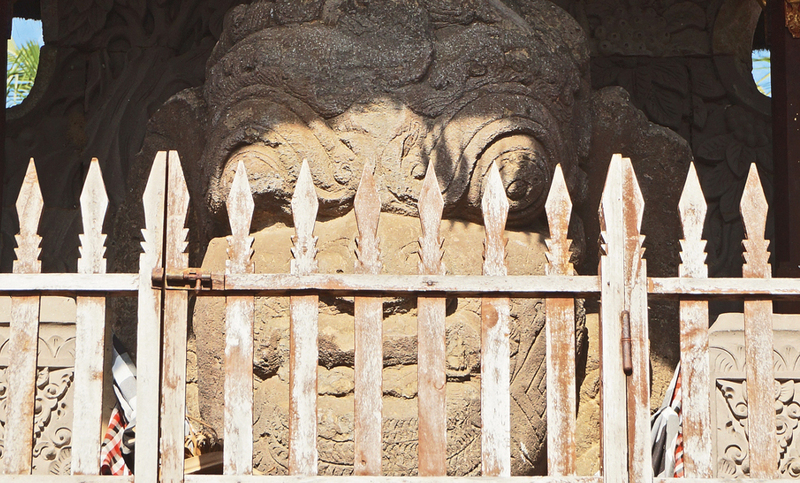 But around 700 years ago, in the 1300s, Klungkung was the home base of the ruler of the island, making the region not only the place for the central government, but also the centre of Bali’s arts and culture. 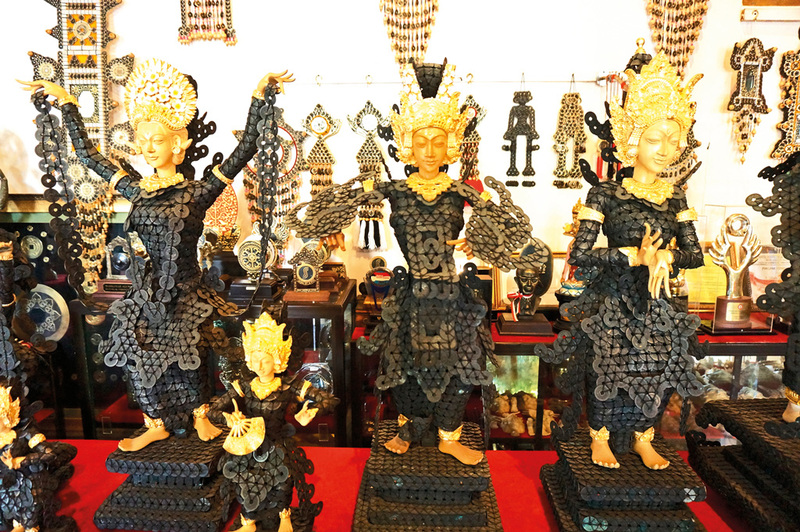 Today, away from the tourist radar, some of the island’s finest artists and craftsmen are still working hard in the villages of Klungkung, crafting and conserving the traditional arts that have been passed down through generations. Today, Klungkung is mostly known for its Hall of Justice or known as Taman Gili Kerta Gosa, a historical site located in the heart of Semarapura, the regency’s capital. The most famous attraction in Klungkung, Kerta Gosa was built in 1686 inside the complex of the Semarapura palace. Kerta Gosa’s court room is an elevated gazebo with a rectangular table placed in the centre along with six chairs for three judges, who were priests, and three assessors. And while the antique wooden table and chairs are prized items, it’s the centuries-old paintings on the hall’s ceiling that really steal the spotlight. Sporting the typical Kamasan style, the paintings on this hall’s ceiling depict the story of Bima on his journey through hell. The strongest of the five brothers from the Mahabharata epic tale, Bima braved the underworld to save his parents, who were being tortured for the sins they committed when they were alive. On his journey, Bima had to fight the soldiers guarding the underworld, and went past people being punished for committing adultery, stealing, cheating, being greedy, and many other sins. Once Bima reached the place where his parents were being punished in, and defeated the executioners, he then brought his parents to heaven, where he had several other fights with the guardians of the heaven before he could finally secure a place for his parents there. 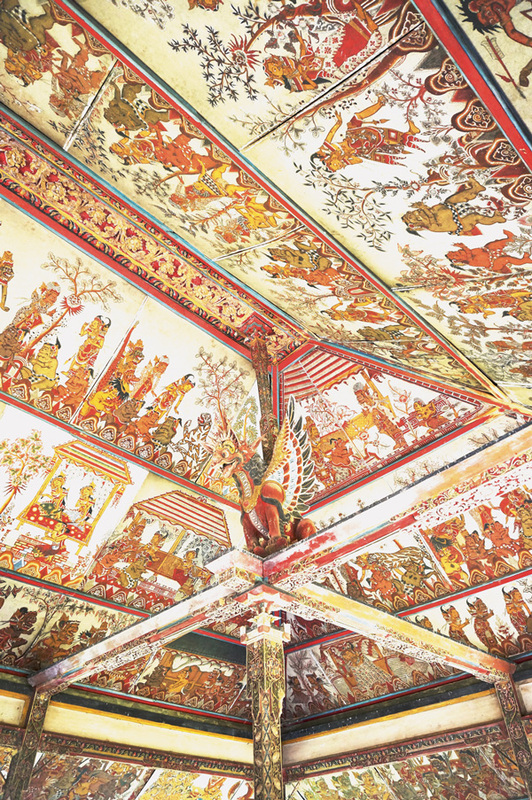 The Kamasan style paintings also adorns the ceiling of Bale Kembang, also in the same complex of the Hall of Justice. Meaning “floating gazebo”, Bale Kembang nestles in the middle of a big lotus pond, with access via a bridge decorated with Balinese statues. 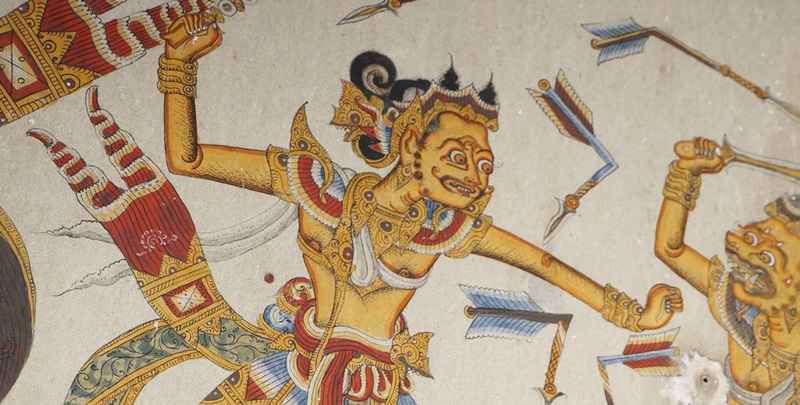 Anyway, the intricate paintings, in classic Kamasan style, is an important part of the Bali’s history and culture. 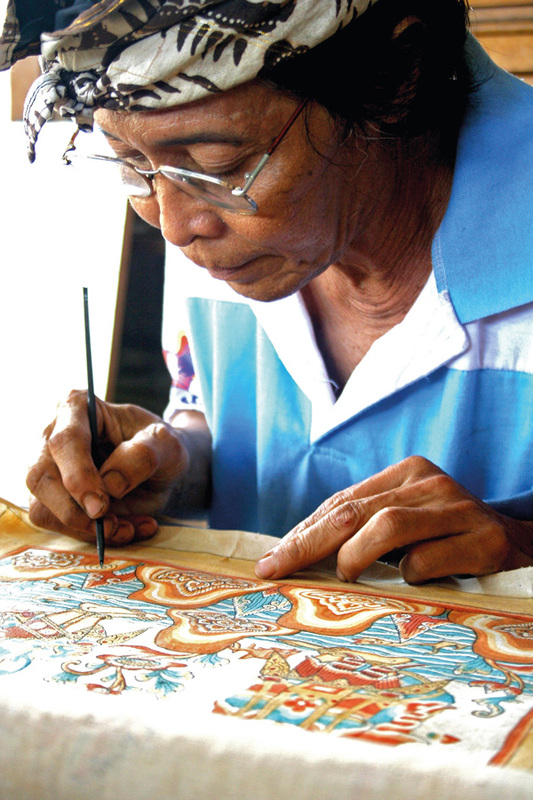 Nyoman Mandra, a respected Balinese painter, still maintains this ancient tradition of painting. 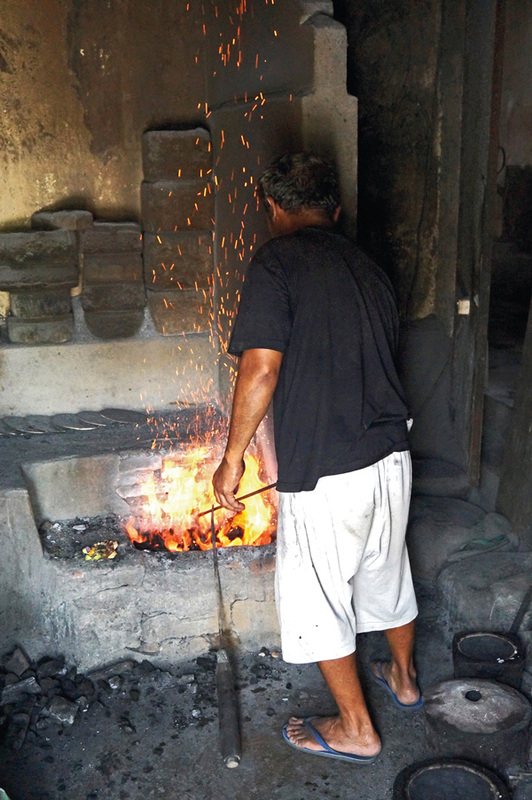 In his home in Klungkung’s Kamasan village, Mandra has set up a sanggar (studio and workshop) to pass this tradition to the younger Kamasan villagers. Mandra’s strong commitment to the artwork of his ancestors is evident not only in his own pure interpretations of the Kamasan style, but also in his encouraging younger artists to adopt the technique. Aside from the villagers – young and old – Mandra has also had visitors as his students. Days spent at Mandra’s home studio are filled with tales of Klungkung’s paintings, which he tells skilfully as he strokes his bamboo pen along a rough canvas. Kamasan village and its ancient tradition of painting, derived from the art of the great Javanese empire of Majapahit, is far from the usual tourist tracks. 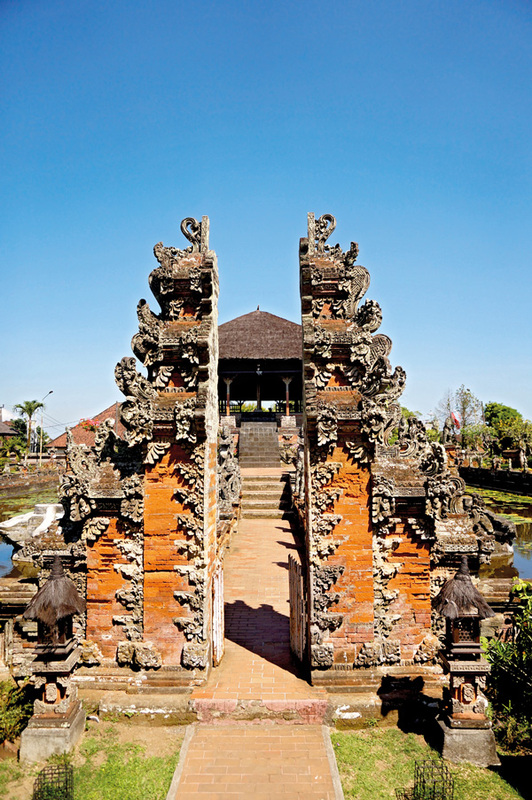 Consequently, most visitors to Bali get the false impression that Ubud is the centre of the island’s art. The art of Kamasan is a classic style based on the shadow theatre or wayang puppets. Kamasan once had plenty wayang puppeteers, but few remain today. For many centuries that tradition was practiced by the Sangging descent group, who gave their name to the section of the village of Kamasan where present-day artists are still found. Early in the 19th century the group died out in Kamasan due to lack of male heirs, but they passed on their traditions to others in the village through the most renowned artist of that era, Modara. Despite the many developments in Balinese painting during the 20th century, the classic style of Kamasan still remains. It’s one of Modara’s descendants – Nyoman Mandra himself – who has made huge efforts to keep the Kamasan’s art true to the style of the ancestors. Mandra was a student of one of the leading artists of the previous generation – his uncle, Nyoman Dogol – and from him Mandra also learned to observe the many great examples of Kamasan paintings found in the village temples. 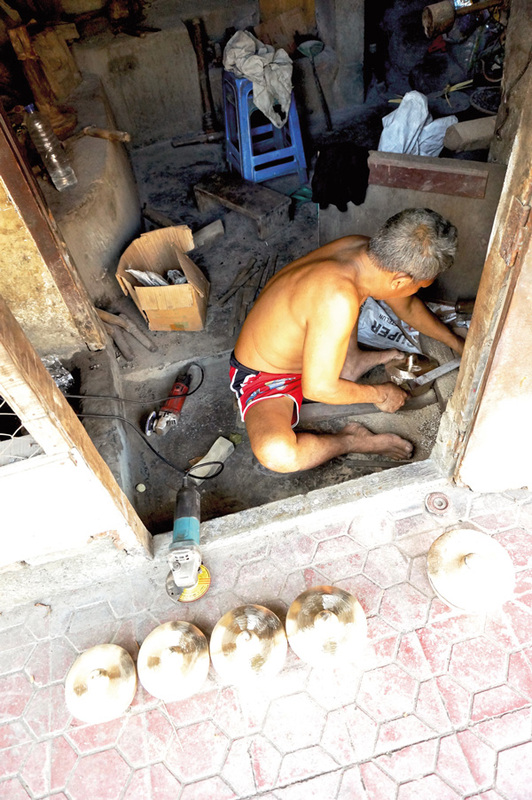 Also in Kamasan is a group of craftsmen, the makers of the Balinese hollowed coins or known as pis bolong. The coins are made from five different elements known as Panca Datu or “five strengths of life” (iron, silver, copper, gold, and bronze). Traditionally, the coins are compulsory in quite a number of the Balinese Hindu rituals. Therefore, prayers and offerings need to be made prior to the whole making process. There was a time when these coins became a rarity; something that is odd especially due to their religious importance. Plenty of the coin craftsmen had abandoned their home workshops to work in the hospitality industry. And to anticipate scarcity of the coins, a home industry named UD Kamasan Bali was set up to continue the production of the coins, and at the same time conserving the tradition that has been practiced for centuries here in Bali. 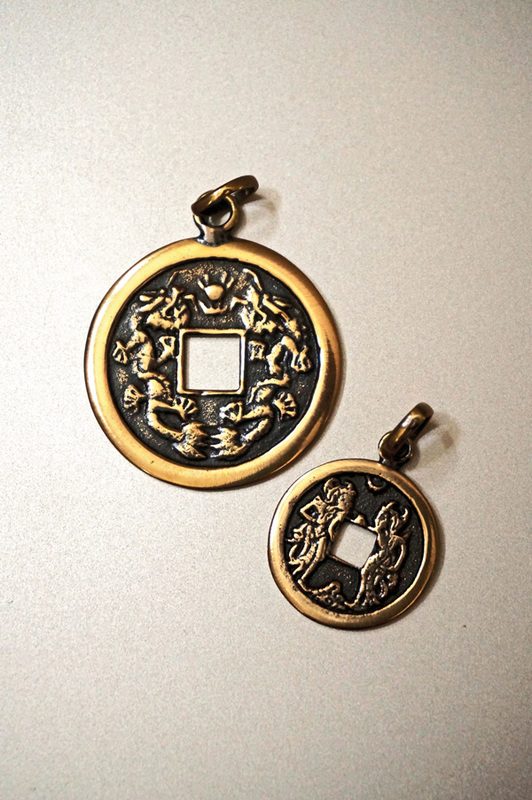 With the Kamasan villagers’ natural flair for art, these coins are also shaped into beautiful statues and wall decorations, in addition to those for religious purposes. Beautiful creations that portray the Hindu gods and goddesses that are shaped from these coins can now be found adorning a number of resorts on the island, and even outside Bali. The pendants, with engravings of animals and characters from epic Hindu tales can also be found in popular stores around the island’s south. Then again, why buy from a Kuta store when you can purchase the coins right on the spot of where they’re made, especially if you’re also eager to explore. Shopping here is an art in itself; it’s not simply walking into a shop, picking a coin from a shelf and paying for it. Talk to the shop keepers, for they might be the artists that create the works of coins you’re about to buy. You can also observe the whole process of the coin making here; from moulding, carving, and polishing. Just ask, and you’ll be led from the showroom to the workshop upstairs. Anyway, away from Kamasan to the west of Klungkung, Tihingan village is a rare gem even in the artsy, culturally rich Bali. The village is where the music on the island comes from; it’s bustling with life, with its residents busy maintaining their humble lifestyle by making the traditional Balinese gamelan musical instruments. In Tihingan the Gamelan production takes place in the villagers’ home workshops, done by both regular craftsmen and specialised experts (or known as Pande Gong) to set the tones of each of the instruments. A Pande Gong is an experienced music instrument craftsman, and almost all of the traditional music instruments found in Bali are made by a Pande Gong. 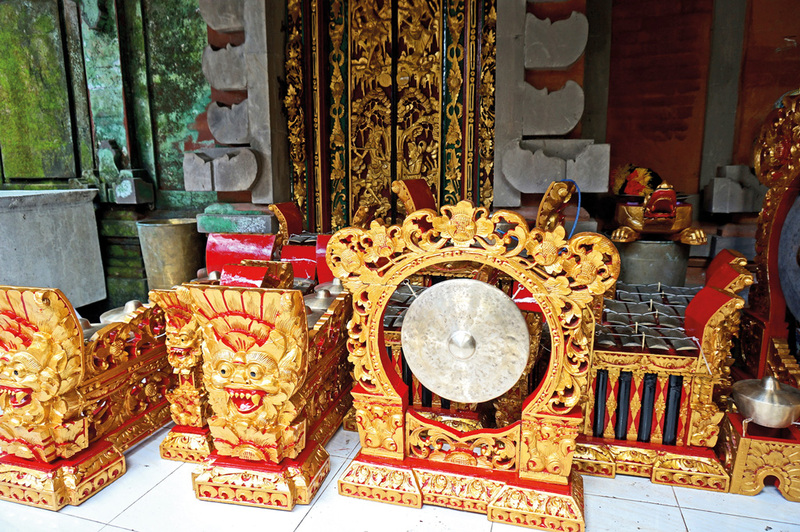 Every home workshop in Tihingan is open for visitors to visit, such as the Gong Kembar workshop, owned by I Wayan Sumandi (phone +62 812 394 8476). Here you can observe the craftsmen working wood and metal, shaping the raw materials and crafting them into the final instruments before being shipped to other areas in Bali and even overseas. It could take around three months to craft a complete set of Gamelan, which normally consists of Jegogan, Jublag, Pemada, Kantil, Reong, Tawa-tawa, and Kempur. Tihingan is located about three kilometres west of downtown Semarapura. If you’re coming from Kerta Gosa direction, go straight at the intersection with the statue of Goddess Saraswati. 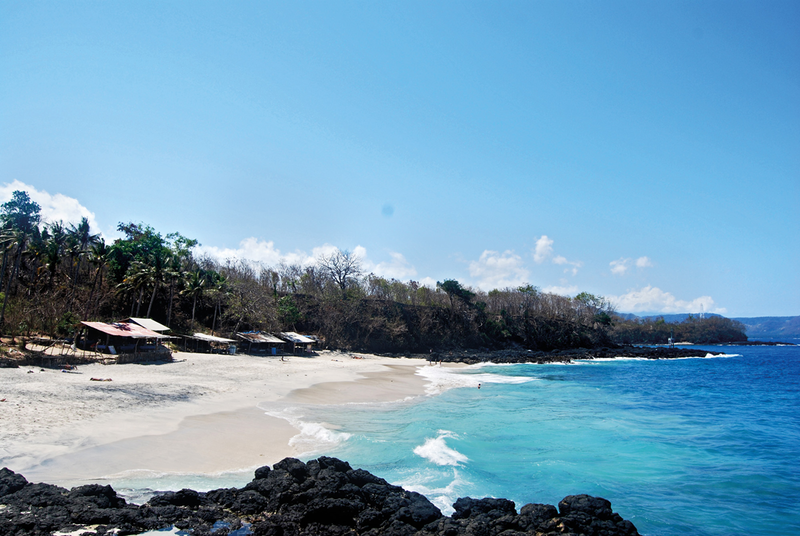 Being so near from Semarapura’s main attraction, it’s odd to learn that, given music is an important part in the life on the island, Tihingan as a music instrument craftsmen village is not listed on Bali’s tourism map – especially since visitors can have a glimpse of the ‘real Bali’ here. 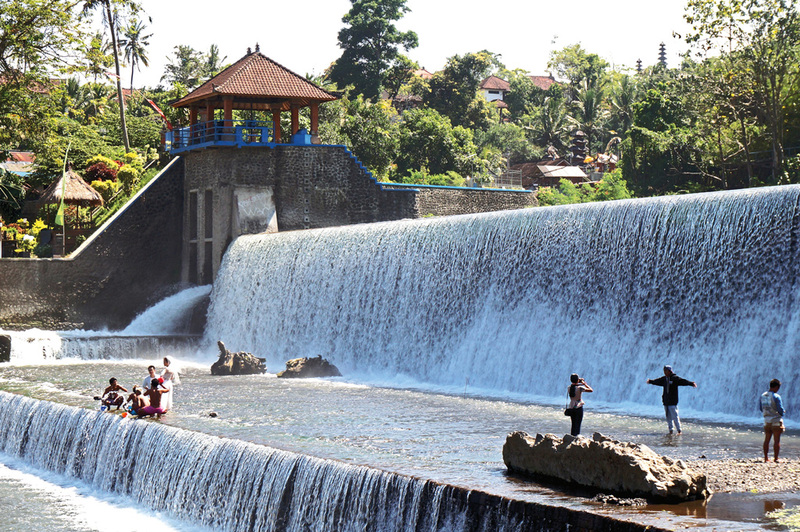 Along with the artistic villages and Kerta Gosa, Klungkung is also home to Unda River. Currently booming as a hotspot for pre-wedding photoshoots, the river is also a place for the locals to have splish splash fun, bathe, do their laundry, or just simply relax before sunset time. The river’s huge dam is probably the main attraction here. On weekends, you’ll see families, young couples, and teenagers posing against the dam for their smartphones. There’s also a restaurant where you can have a meal or drink by the parking lot, and a gazebo on the lower ground, on the way to the river from the restaurant, where you can watch all the action on the river below. Then there’s Museum Nyoman Gunarsa. 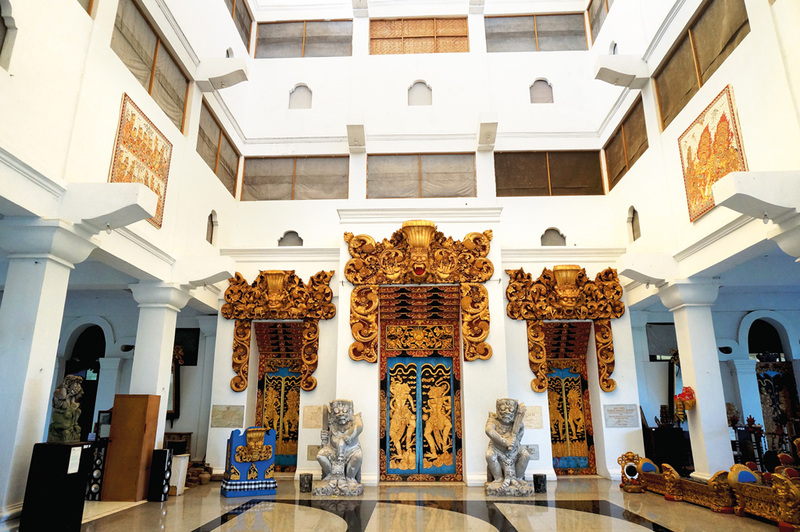 Locally referred to as Museum Seni Lukis Klasik (museum of classical paintings), the museum is the private gallery of the late Balinese maestro Nyoman Gunarsa. Founded in 1990, the museum houses Gunarsa’s artwork collections as well as the maestro’s own classical and contemporary Balinese artworks that range from paintings, sculptures, and antique items. The museum consists of three floors. On the first floor you’ll find centuries-old classic Kamasan paintings, mostly painted by unknown artists. Gunarsa’s works can be found on the second and third floor. For a Klungkung retail therapy, the Klungkung Art Market is the place to be. Located just behind the car park at Kerta Gosa, the market is a good place to explore the Balinese shopping experience in a natural way, get in touch with the locals, and practice the art of negotiation. 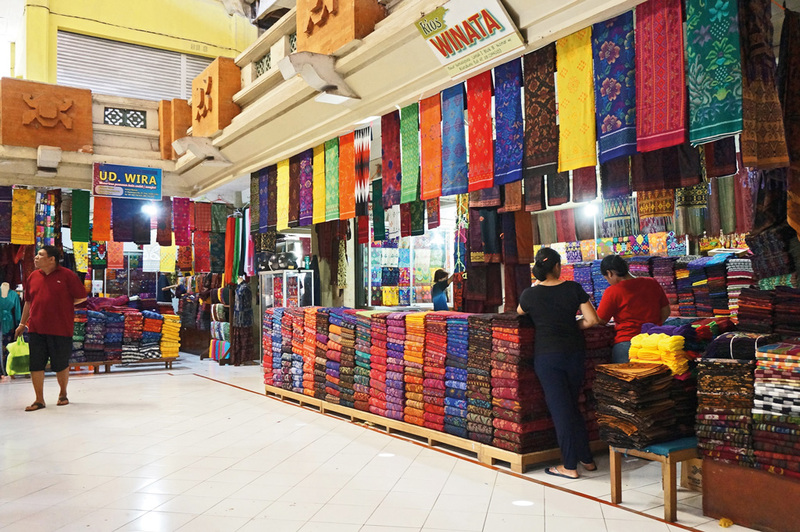 The myriad of shops here offer a wide range of products such as ceremonial items, the ikat woven fabrics, sarongs, and plenty of trinkets. There’s also an adjoining market selling fresh produce and spices. Unless you’re adventurous, then there’s not many dining options to choose from in Klungkung. With that being said, there’s one place that offers good coffees and nibbles for your mid-afternoon booster. 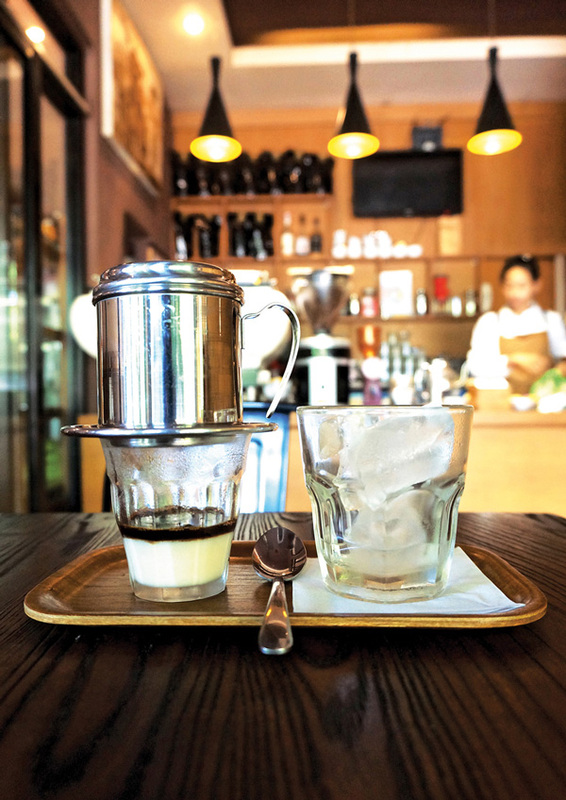 The name of the place is Papilas Coffee House and it will delight the coffee lovers, especially since it uses La Marzocco, a state-of-the-art coffee machine that is also quite a rare item even in the posh Seminyak. But if you’re ordering your coffee with milk, be sure to ask for fresh milk – otherwise they will serve the sweetened, condensed milk. The food items here are okay, and they range from pastas, pizzas, pastries, and the local fried noodle and rice.